Brrr….. it was cold this morning when I fired up the Rabbit and headed out to the house at daybreak today. The thermometer on the vee dub’s dash read a finger numbing 24 degrees Farenheit as we chased the rising sun down the valley. Earlier I awoke with anticipation, for I had not seen the job site in nearly a week. I was anxious to see what if any progress we were making. 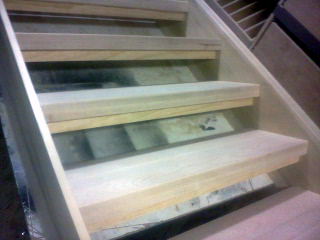 There was a chance too that we’d set the stair case’s today as well. One man's frost bite is another man's paycheck. Man made snow being blown onto a local ski resort's slopes this morning. Once at the house I turned off the car and stepped out on the frozen ground. I was actually a bit relieved that the frost and cold had firmed up the earth a bit making surveying the build a fair bit easier. All the rain of the previous weeks had turned everything into a muddy mess. For now, at least, all was firmly held together with morning frost and ice. Looking around I could see the last of the windows had been installed. I still had to crimp the expansion tube and should probably pay some attention to the nailing flanges to seal them up but that could wait for another (preferably warmer) day. I diverted my attention and joyfully gazed upon the house, focusing in on the black rectangles adorning the exterior doors. Our door handles are installed! Hardware. Pic of our Emtek Orion front door handle in oiled bronze finish. Interior view of the Emtek sideplate that adorns another exterior door. The knob isn't the most ergonomic form in the world but it feels solid and suits the architecture of the house. Beyond the door hardware, not much is happening. Siding is going up at a pace somewhere between snail like and slow & steady, but they’re doing a quality job and caulking along the way; which means the painter won’t have to caulk. We still are waiting on the electric meter. Until we have that the temp furnace won’t be hooked up. Work on the cistern has stopped as everything is now encased in ice. The idea of installing the stairs fell by the wayside today; better to wait for a warmer day. This week the stairs will be dropped of. We should get the laminate for the kitchen cabinets as well. We were fairly successful today selecting finishes. Christine and I went out and landed upon selections for the exterior flood lights as well as counter material for the kitchen. Floods will be nondescript units off the shelf of Home Depot. The counter material will be Silestone quartz; most likely in a Grey Expo color. The Silestone was pricey but cheaper than pretty much all other quartz brands out there. It should prove to be low maintenance and look pretty nice. We also chose all the tile for the entire house. The nice thing about being tired with selecting materials and making decisions is that you can cut to the chase pretty quickly and pick something. In about a half hour we had a color combo we liked for the master bath and the tile for the boys bathroom. If it doesn’t look good we can always rip it our later and remodel. I doubt this will happen, we’ve been fairly lucky in the past with selecting finishes that work together. The house will be fairly eclectic so that affords us some levity. Seems with the cold weather everyone’s hibernating at the job site but that should change, hopefully, in the coming weeks. Meanwhile, enjoy today’s pics. Light fixtures are trickling in. Here's one of the pendants going over the dining room table from Barn Light Electric. It's an old acetylene tank head. It's heavy. It's cooler than any light fixture I've ever seen. And I've seen a lot of cool light fixtures. Trust me. South face of house soaking up some late Autumn morning rays. First floor tile combo. Dark rust tile for entry, master bath, half bath and laundry room. Green glass tile for master shower. Miratek trim and red cedar siding on back porch. Flooring for Christine's studio and craft room. Shaw laminate. On the off chance you're interested in such thing (as opposed to listening to me wax poetically about the nuances of picking out lighting) you can see here how the sofits are constructed. This entry was posted in Construction, Cool Stuff, Siding and tagged building process, house, siding by Chris. Bookmark the permalink.